Dog training like dog breeding and raising is very political. This page is for our philosophy and the training methods we use at ADASDF. Different types of jobs that dogs perform require different types of training. A military dog is not trained to do the same job nor is it trained in the same manner and method as is a Therapy dog. And different dog breeds have different characteristics and temperaments, this is why you don't see a hunting spaniel as a guard dog. 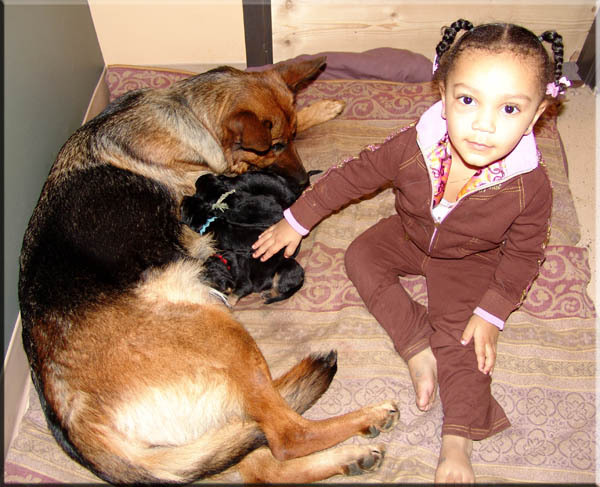 We primarily use the German Shepherd Dog. We use the German Shepherd Dog because of its ability to work, loyalty, solid nerves, sturdy frame, and most of all its intelligence. I have found the blood lines we are using train very fast. 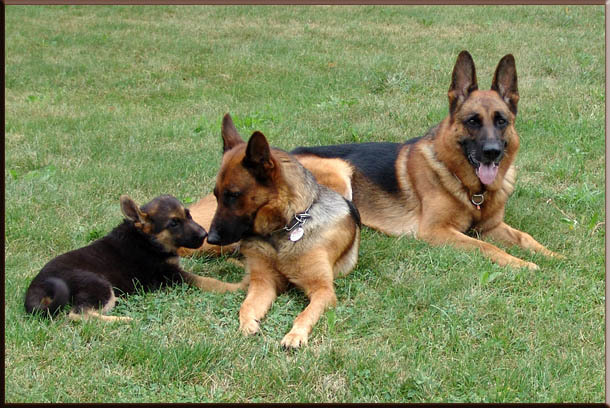 Just like children in a family, pups from a litter are individually different but have similar genetic traits. Not all pups from a litter become service dogs. Some are to high drive but without drive a dog will not work. So it is a fine line of balance that gives a dog the ability to gently and confidently function as a service dog. Very high drive dogs need to have a job that provides continuous work for them. The German Shepherd Dog is most happy when working and having a busy purpose. I know our dogs bloodlines and have a good idea of what they will produce. In the future we may expand our breeding program to include another breed which we are looking at and researching. Our philosophy is to train by motivation. That motivation can be reward or a correction. Reward can be food, a pat on the dogs head or side, or a word of praise. Correction can be tap of the collar or a firm word, like NO. I believe balance in training is key. If you are all kisses and hugs the dog will not respect what you are trying to teach her/him to do and will put its own will above your desire to complete a task. If you are too hard, I call this the "Yank and Crank" method, then the majority of dogs will lose their desire to work and please you. Most dogs trained in this method will coward and break. If you have a very strong willed dog that can endure that old school yank & crank style of training you better watch your back. This kind of dog may work for you but you will need to be on your toes at all times because this manner of dog will via for alpha. This strong willed type of dog can be a dominate dog and generally will not tolerate other dogs or strangers. He will work in defense rather than work in drive. I feel to train a service dog in the yank & crank method is not necessary and irresponsible because it produces a dog that can never fully be trusted to work in public independently. Instruction for our service dog training when handling and teaching our dogs is; first command then reward. We always mark the reward. If the dog does not comply then it is - command - correction - reward. It will not take long for that to change to what you want and that is; command then reward/praise. The goal is command, task accomplished, reward. One of the types of training collars we use are prong or pinch collars. If used properly they are in no way cruel for the dog. I have found that a collar properly fitted up behind the dogs ears, hooked on both rings, is a fast, safe, and an easy way to train. You simply have to only give a little tap or pop correction on the leash when training to get the dogs attention during obedience training. The dog quickly learns and understands what you want from them. Having a loose collar and letting the dog choke themselves is worse and not effective. It only builds up resistance to obedience training and the training takes a longer time to achieve the goal. A collar I despise is the head type halter collar. I do not like this type of collar because first of all I have seen more than one dog with a ridge or scabs across its nose. The dogs head is held down and restricted so it cannot think to calculate it's task. It will not have an intellectual understanding of its task. In training we first train all of our service dogs basic obedience as this is the foundation to learning and good behavior. Once a dog starts to learn they learn the next task faster. Learning becomes less stressful and easier for the dog. I believe that once a dog starts to learn tasks they enjoy it. We train in what I call "building blocks". That is to train in steps and build one command upon another command. 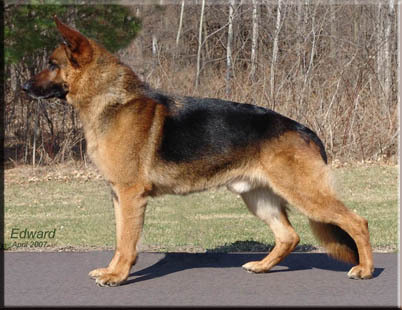 Sequence training is another reason I like the German Shepherd Dog because they seem to be able to think and perform in sequence. This is how we train for a sequence task. Let's say you want to have a dog take a bottle off the shelf and bring it to you. You will need to establish certain commands before beginning this. 1. I would train the dog paws up and paws down. 2. Then train the retrieve command with the bottle you're going to be using on the shelf. I use the word "brings". It is important to always consistently use the same word for a command. This is imprinting the dogs mind to understand a certain word means a certain task. 3. Next I would train the brings command to add, "to my hand". As the dog is approaching you with the bottle command "in my hand" and place your hand palm side up to the dog. At this time the dog should be able to independently off leash do each of the above tasks. 4. Now it is time to put them all together. For the first few times learning this new sequence of tasks I would put a short tab leash (I like a short tab leash for training a new task as the dog does not get entangled in the leash and distracted. But at the same time the leash is close at hand for you) on the dog and bring the dog over to the shelf. Once you are at the shelf tap on the shelf and give the paws up command. Tap on the bottle and give the brings command. Once the bottle is in the dogs mouth then walk back a few steps and command the dog, "in my hand command". I would do this several times. 5. Now for the test and proofing the task, "brings bottle to my hand". Move several feet away from the shelf and bring the dog to your side. Let the short tab leash go and tell the dog, "brings bottle to my hand". When the dog returns anticipate success and have a treat in your left hand and as the dog drops the bottle into your right hand quickly slip it a treat from your left hand to the dogs mouth. If the dog does each step correctly just continue to repeat this until it is clear in the dogs mind. Do not over train and always try to end in success before ending that training session. It is better to train in short segments during the day rather than trying to learn to much too fast. The dog will be more willing to work and less frustrated. We have developed and use different types of equipment for various tasks. For example to teach a dog to retrieve we use the Retrieve Training Mesh Bag, Item #707640. You start this retrieve training before you feed your dog. A hungry dog works better than a full dog. I put something that is very scented and that the dog is crazy for in the bag and hook a leash to the loop end of the mesh bag. Then I pull the bungee cord top of the bag closed and throw it across the floor while holding onto the end of the leash. Be sure your dog is watching you. Throwing the bag will generally excite the dog. When your dog runs to get the treat bag, pull him/her back to you with the mesh bag in its mouth. As your dog is coming back to you, call and use the word that you designate for bringing the object. This is imprinting, in your dog's mind, that bringing you the bag results in a reward. As soon as your dog gets to you, then open the bag and give your dog a treat from the bag. The reward must come as soon as your dog gets to you. After your dog gets used to bringing you the mesh treat bag, then you follow the same procedure without the leash. If your dog does not want to bring the mesh treat bag, then go back to attaching the bag to the leash. When this step is done successfully, you begin object retrieval by attaching a lightweight object to the bag (for example: a hand towel, toy, keys, etc.). By this time, the dog is understanding that bringing you different objects means he/she will get a treat. Now try the same technique without the bag, just the object. Always mark the successful retrieval behavior with a reward (a treat at first, and then move into a pet or praise). From there you can move into training a dog to open doors. I use the Open Command Training Rope, Item #401718. This is how I train a dog to open a an object like a door, cupboard, refrigerator, drawer, etc. I have the dog in the room to see that I am attaching the OPEN COMMAND Training Rope to the object. I have treats concealed in my left hand, I touch the knot end of the rope and then I tell the dog OPEN. Do not over talk to the dog, it will only cause confusion. Stay calm and firm and consistently touch or pat the knot end saying OPEN. At first the dog has no idea what you want. As soon as the dog puts its mouth on the knot I mark the behavior and immediately slip my left hand under the dogs nose and give him/her the reward. I have had a dog that learned to open doors with only five taps on the knot. He was trained with praise not food but I will tell you that is not usual and most dogs do not learn that quickly. A dog that is used to learning will learn new tasks faster than a dog that is just starting training. Once the dog successfully learns that putting the knot in its mouth gives him/her a reward they will associate that the word OPEN means getting a reward. Now if you have a dog that does not want to put the rope knot in its mouth you can open the dogs mouth, place the knot in the dogs mouth, give the command "OPEN" and then quickly replace the knot with the treat or reward you have chosen. I train in what I call building blocks, if the dog already knows the "brings" command this "Open" command training will be easier and faster to learn. 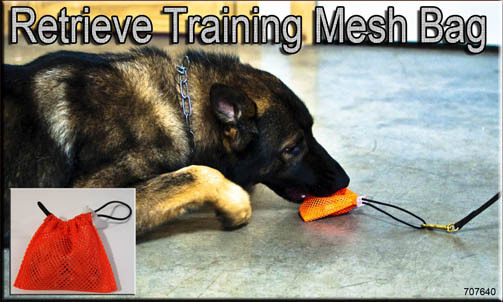 (If you want to know how to train for the "brings" command see the article in the product 707640 Retrieve Training Mesh Bag). 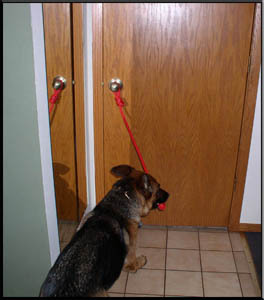 The next step in the Open Command training is to get the dog to pull the rope back to you, causing the door to open. Once you have taught the dog that when you say OPEN it goes over and grabs the rope knot end then you will ask the dog to bring it to you. You can also call the dog over to you. The dog must keep the rope in its mouth. Do not reward unless the dog keeps the rope knot in its mouth. A little tip is to be prepared to see where the door will swing. If the dog grabs and door and it swings to fast hitting the dog it will make the dog leery of pulling the door open. Eventually the dog will learn how much pressure to pull on the rope. Until then I generally just put my foot or elbow in front of the door about 12 inches away from where the door will swing back to block just in case the dog flings the door open to fast. You can increase the distance between you and the door as the training continues. 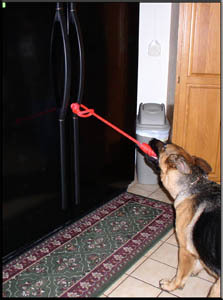 Once the dog independently goes to the rope on the OPEN command and pulls the door open you can drop the "brings" command and use just the OPEN command for this task. You can then move unto another object to open placing the OPEN COMMAND Training Rope on it. After the dog clearly understands what I want I may place and leave the ropes on different objects or doors in the room. Eventually pointing to which door I want open. Dog training is a process and the secret is consistency and patients. Don't try to learn to much too fast as it will frustrate or confuse the dog. If you just watch your dog during training, not over talking to the dog, you will see when the dogs brain kicks in and it understands what you want. Keep it simple and try to have your command words sound different from each other. I try to always end each training session on a positive note because next time the dog will be more willing to learn and want to please me. 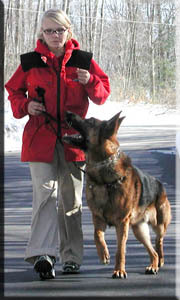 Heel Dog Walks beside the handler and the dogs shoulder is along side handlers knee on the handlers left side. Sit Dog places its rear on the ground when handler stops or on command. Down Dog lays down, paws out front. Stay Dog stay in position where handler places the dog. Here Dog comes to handler upon handler calling the dog. Steady Dog stays in position while handler holds and leans unto dogs shoulders to push him/herself up or lower him/herself down. Lean Dog leans it's body against handler. Paws Up Dog places it's paws up on object handler desiginates. Paws Down Dog places it's paws down on the ground. Back Dog walks backward to back up. Pull Forward Dog pulls wheel chair in forward motion. Pull Back Dog pull wheel chair in bacckward motion. Brings Dog brings designiated object to handler. Brings to my Hand Dog brings desiginated object and drops in handlers hand. Hold Dog holds object until told to let go of object. Carry Dog accepts weight of objects and the use of a backpack. Open Dog pulls door, drawer, or other open with pull rope. Close Dog closes door by pushing door closed. Light On Dog uses nose or paws to push light switch in upward position. Leave It Dog ignors what it is looking at, ie, another dog, person, food, etc. Go Pee Dog goes to the bathroom at directed place where handler desires. Released Dog is allowed to stop working and rest.